That’s the sounds of The Silence. This year, though, that movie is called The Silence and it’s coming to Netflix this month. 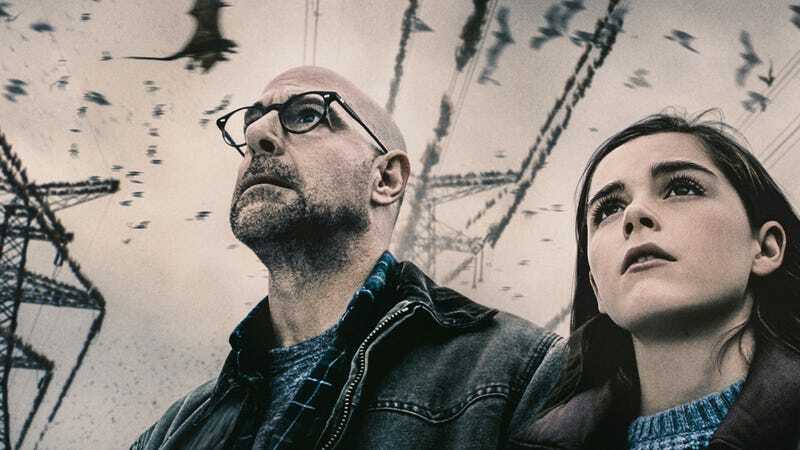 The film is based on a 2015 novel from Tim Lebbon, which means it predates last year’s film, A Quiet Place, by some time. Plus, when you watch the trailer, you’ll see that while the overall ideas are similar, this is a very different take on the material. So, unlike A Quiet Place, The Silence seems to tell more of the origin of this soundless world instead of a story from later in the timeline. The creatures don’t seem to be supernatural in nature either. More likely, they’re just kind of really fucked up bats. Then, based on Netflix’s description, Kiernan Shipka’s character has some kind of mysterious power because she lost her hearing at an early age. So there are lots of differences between the films, besides the fact that The Silence was written almost 20 years prior. But, of course, the idea of a family (which here includes Stanley Tucci, Shipka, and Shipka’s Chilling Adventures of Sabrina co-star Miranda Otto) dealing with this world is certainly familiar. This is just a wild guess, but what A Quiet Place probably did for The Silence is give Netflix confidence to say, “Hey, people like this kind of movie. Let’s make our own.” And if The Silence is half as entertaining as that one, we should be in for a treat. Directed by John R. Leonetti (Annabelle), The Silence hits Netflix April 10. A Quiet Place 2, which this is not, will be out in ANOTHER year. So we’re going three for three. Update: An earlier version of this article incorrectly stated the publication date of Tim Lebbon’s novel. It has since been corrected.